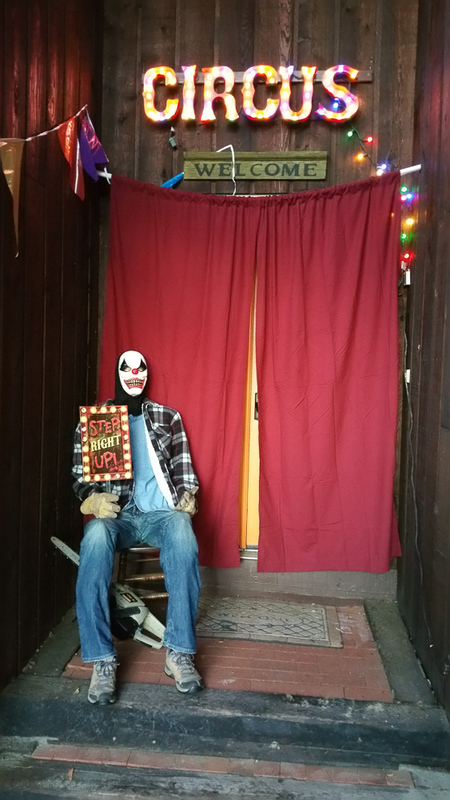 For this year I decided to do a Circus themed Halloween party. 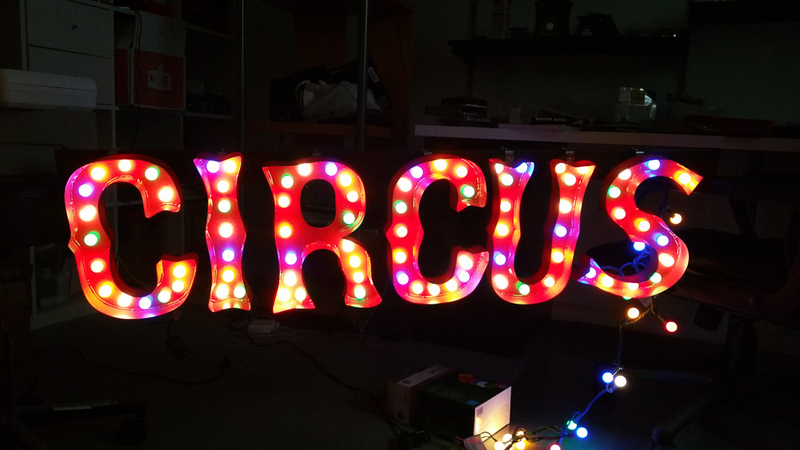 One of the major props for the part was supposed to be a large lighted “Circus” marquee sign (also called dimensional lettering). 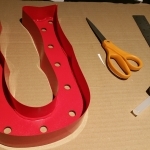 There are more than few tutorials on how to make such sign, most of them involve using some kind of thin sheet metal stapled to thick wood letters cut out with some kind of jigsaw. 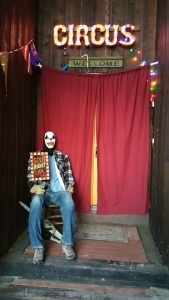 My goal was to make something a little simpler and on a budget as this was not meant to be a permanent installation. So I decided to use my laser to cut letters out of 12″ x 12″x 1/8″ pieces of baltic birch plywood which I recently ordered a hole box from eBay. Metal border was out of the question because plywood was very thin and also font that I chose for letters had many bends and it would be hard to shape metal this way. You can actually hot glue metal flashing to the plywood, and it seems to hold surprisingly well (I tested it)! I tried making letters with corrugated cardboard, but it was just too much work as edges had to be closed with masking tape, otherwise you can see them and looks bad. I found some pretty heavy paper at local arts supply store which wasn’t as rigid as cardboard but also was much easier to work with and had much cleaner look. Also note about lights. 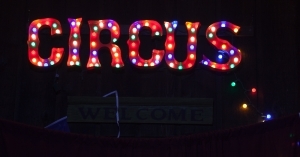 You’ll want to use round type bulbs/LEDs that resemble lights in commercial marquee signs. I found nice ones called “sugar plum” which fit inside my letters. But because there were over 50 pieces in the package I designed my letters to fit most of them. That was mistake, and a lot of unnecessary work. Don’t pack them as densely as I did. 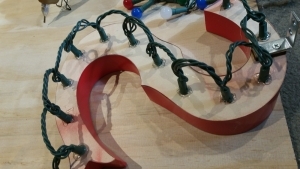 And keep in mind that you’ll need to leave one or two lights between letters for spacing. Also before you start keep in mind that this sign is not meant to be used outside in the rain or snow. First find font you like. 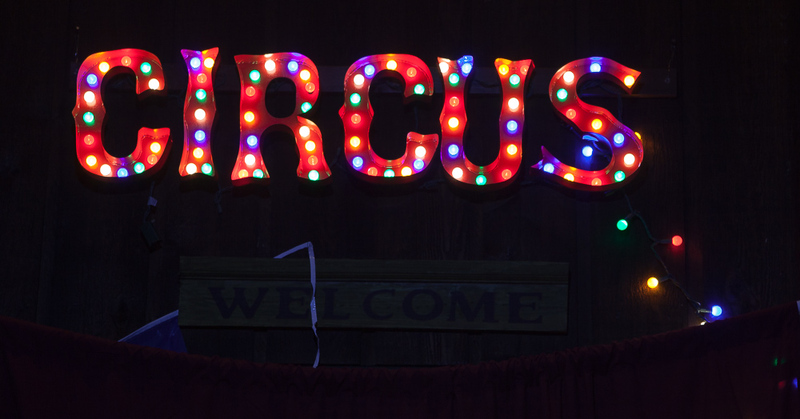 Circus/Carnival type fonts are very distinct looking with triangular “swells” and what I call “snake tongs” :). I suggest you pick one that’s solid and doesn’t have extra graphics/decorations inside. 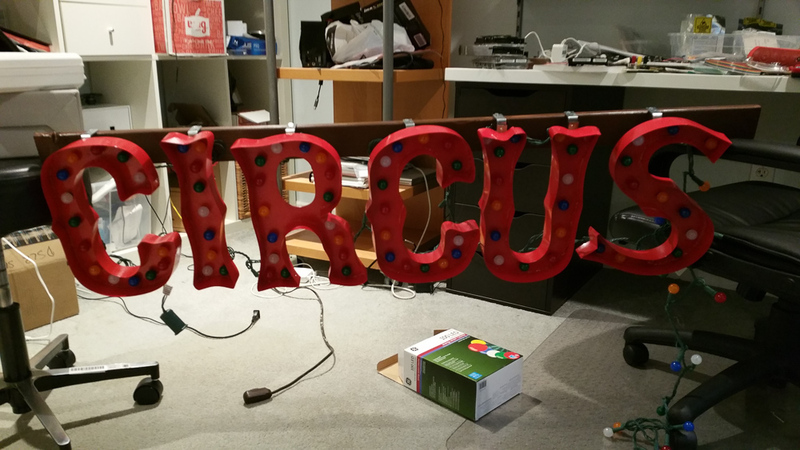 In Illustrator I created word “CIRCUS”, resized each letter to be under 12″ high and converted it to outlines. Then I spent some time tweaking paths, simplifying them as much as possible and also thickening some letters like “S” so lights can fit inside. You don’t want overly complex shape as you’ll be hot gluing paper around it. Now draw circles where holes for the lights will be cut. How many holes depends on how many lights you have. Don’t forget that there will be at least one left between letters cause lights are usually not spaced far enough. Each letter will have different number of lights, so distribute them so it looks good. Diameter of the holes should be sufficient for base of the light socket to pass (with some resistance). Most important is that holes are not bigger than light bulb’s diameter! 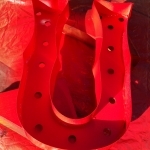 Finally keep in mind that you will be attaching each letter to an L bracket so leave some space on very top for it. 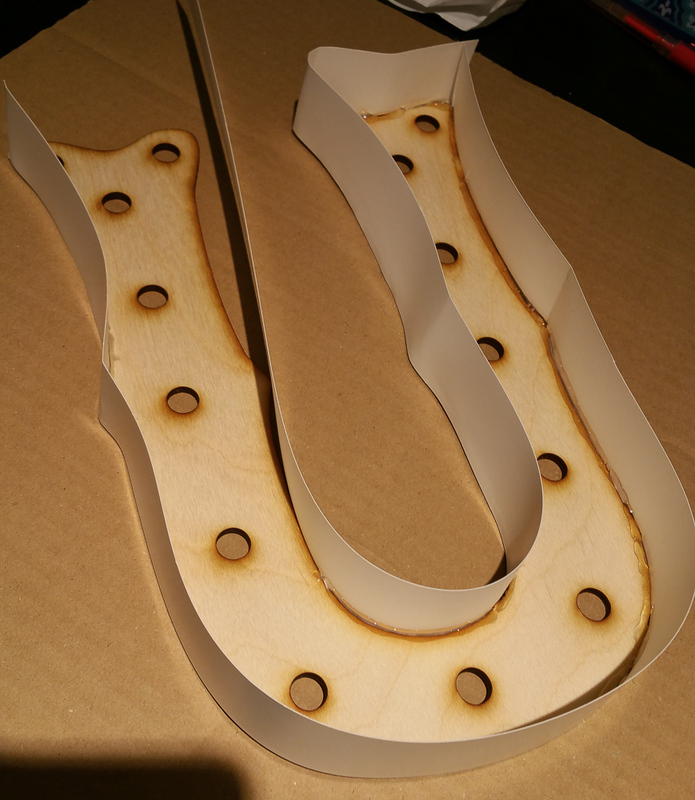 I used my 50W (actually 40W) laser from eBay to cut 1/4″ birch plywood. Import vector file of each letter into RDWorks and set speed and power. I cut all letters from individual plywood sheets, except for letter “I”. It was small enough to fit with letter “C” on same 12×12 sheet. 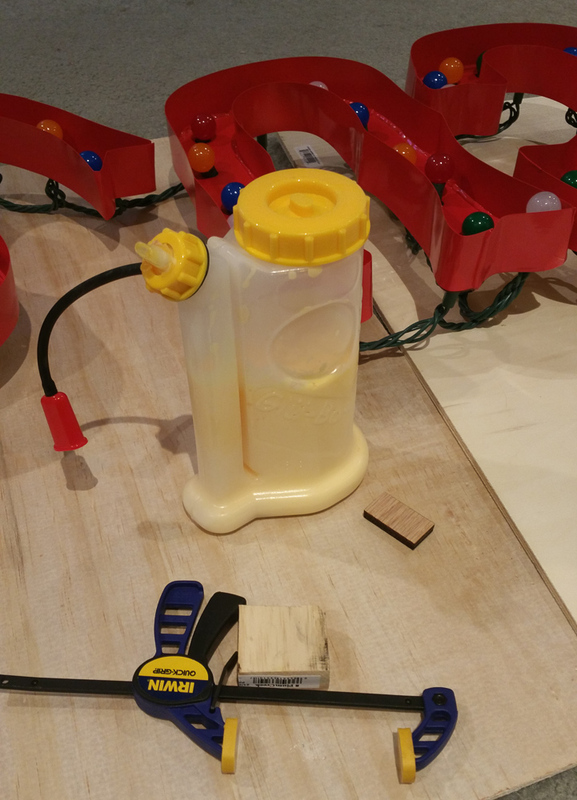 If you don’t have laser cutter, use a scroll saw or jig saw or whatever. It will take you more time but you can use thicker wood. Finally cut long 1.5″ wide strips of art paper. The longer the better. Ideally you want single piece to wrap around letter outer and inner edge so there are less joints. This is the most tedious and time consuming task 🙁 Heat up your glue gun and load glue stick. 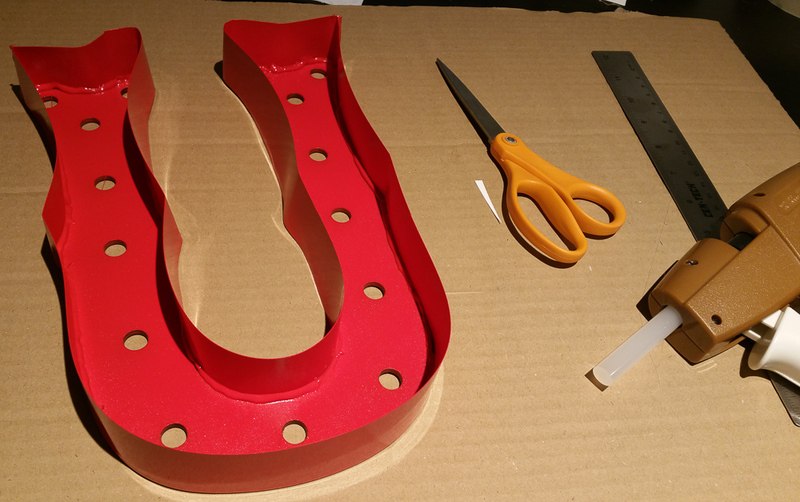 Place your cutout letter or hard and absolute flat surface which you don’t mind getting some hot glue on. Start bending strip of paper around outer edge of the letter. 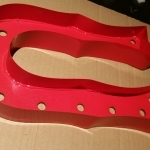 It’s better to start at the flattest part since it create much easier joint. Squeeze some hot glue on the edge where paper and wood meat and hold it until glue solidifies. Be careful, hot glue is … well HOT! Use a piece of paper towel or fabric between your fingers and paper. Go in small sections. It will take some time. Anticipate sharp turns and pre-bend paper around pencil (if turn is round) or flat ruler (if turn angle is sharp) . Take care of making sure paper is on the same level as bottom of the wood. Finally when join paper with a piece of some thin tape which you will paint over later for seamless joint. Once all the letters are prepared place on some covered surface in place with plenty of ventilation and keep them raised a little (i.e. put on some scrap wood) so they don’t stick to the surface. Wear a respirator and gloves. Fumes from spray paint are not good for your central nervous system! Apply 2-3 thin coats, letting dry for 15-30 minutes between coats or as recommended. You don’t have to pain back of the letters as they won’t be visible. Before you start adding lights, you need to prepare letters for mounting. I spent few days decided on the best way to mount letters that would allow for spacing behind them for light sockets and wires. Finally I decided to use L brackets. One problem I had is shortest screws I could find would go thru thin 1/8″ plywood and I didn’t want screws poking. So I cut out small rectangles out a piece of solid oak plank and using wood glue attached them to the top of each letter. In case with letter “U” I used two pieces. 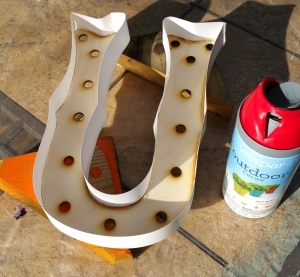 I used tiny clamps for letter “U” because only half of the plank made contact with plywood. I left them to dry overnight and once glue was set, using L bracket as template I pre-drilled holes that were smaller than diameter of 1/2″ wood screws. Pre-drilling here is NOT OPTIONAL. Wood rectangles will split without it. Finally Attach brackets with 2 1/2″ screws to each letter. You can do also do this step after you installed lights. This task was almost as tedious as gluing border. First remove light bulbs/LEDs from their sockets. 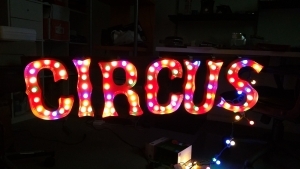 Place your letters to spell out word “Circus” (or whatever word you trying to make). Start inserting sockets with wire from the back and insert light bulbs/LEDs into each. Depending on distance between lights you will probably want to leave one or two sockets between letters. No need to insert lights into those. Plug it in to see if all lights are working. 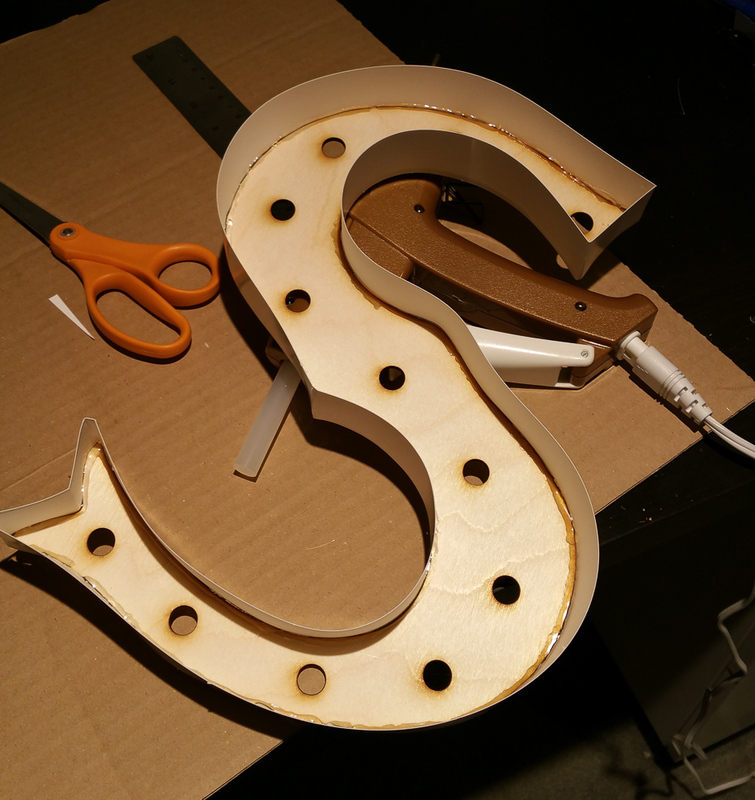 After all lights installed and tested, turn letters around and hot glue each bulb socket to the back of the letter so they don’t fall out or look crooked. This is optional step. Support frame is basically just long piece of wood that holds all the letters. I chose a piece of 1×3 board I had laying around. After measuring how big the sign will be I added some extra space on both sides and cut the board. 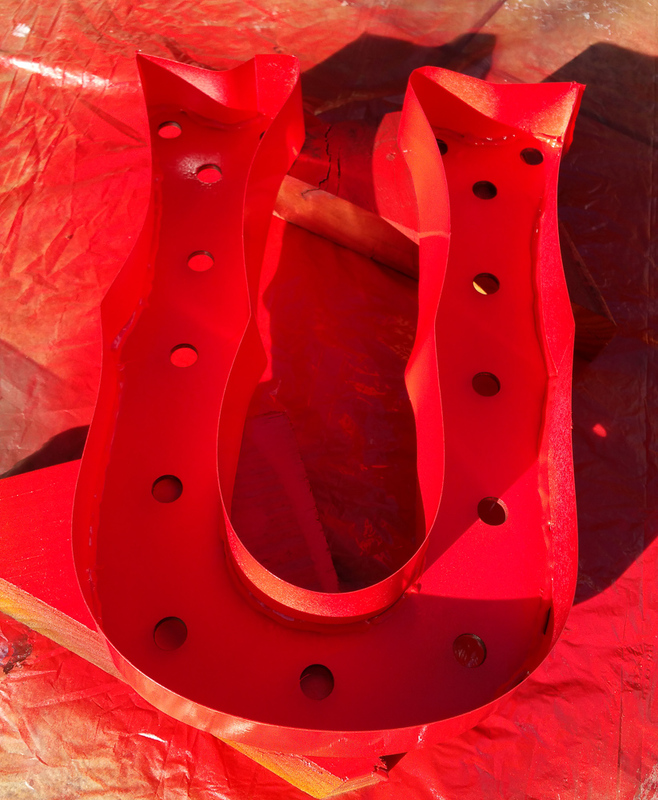 Depending on where you going to mount your sign, you might want to paint this support board with the same color so it’s not as visible. Mine was attached to cedar siding, so I painted it with brown paint. We are almost done! 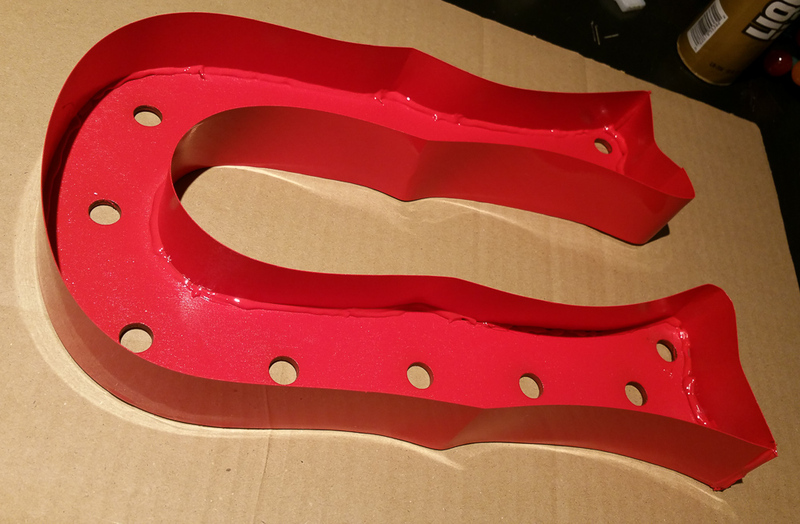 Now we need to attach all letter to the support frame. Attach letters by L brackets to the edge of the board. Here I didn’t pre-drill as screws included with L brackets didn’t seem to split the wood. After all letters were attached I drilled large hole on each end of the board to use as mounting points. Then I made loops out of some strong wire attached thru these holes. 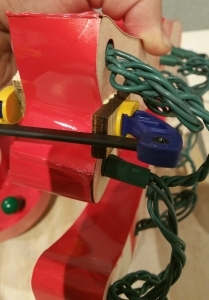 You can then hang sing using these loops. Or you can just use screws to attache board the wall directly if that’s what you want. There are many possibilities. That’s pretty much it. Make sure sing is hanging securely (so it doesn’t fall on your visitors), not exposed to the elements and wired properly to the outlet.